Yesterday, I shared an easy recipe for blueberry popsicles. I mentioned that I made them while making dinner on Thursday night. This is my story of black bean cakes gone wrong! I’ve never made black bean cakes before but thought that they couldn’t be that hard. After all, I had just mastered salmon cakes the week before. The recipe I was using was from Vegetarian Times magazine online. I don’t usually follow directions to a tee, but this time I did because I wanted them to come out perfectly. Really, I wanted to impress my boyfriend with something more for dinner than salad! 4. Preheat oven to 350°F, and generously coat baking sheet with coconut oil. Shape bean mixture into 8 patties (1/2 cup each), and place on prepared baking sheet. Bake 20 minutes, or until patties are crisp on top. Flip patties with spatula, and bake 10 minutes more, or until both sides are crisp and brown. Serve on buns. I followed the steps precisely. Even using measuring cups for the amount of water to add, which I don’t usually do. When I finished step 2 I thought this would be a good time to make the blueberry popsicles while the water was simmering off of the onions and black beans. It was probably about 15 minutes before I got back to the black bean cakes and went onto step 3. There was still a lot of water on top of the mixture but hey, if they had been simmering for 3 times as long as the recipe called for, it should be okay. I pulverized the mixture and then added the remaining quinoa. Also, 3/4 cup of canned black beans is just about 1 full 15oz can. 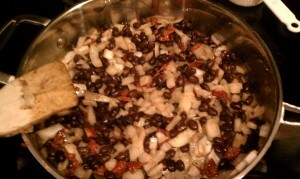 So in step 3 where it says to add the remaining 3/4 cup black beans, I added another whole 15oz can. 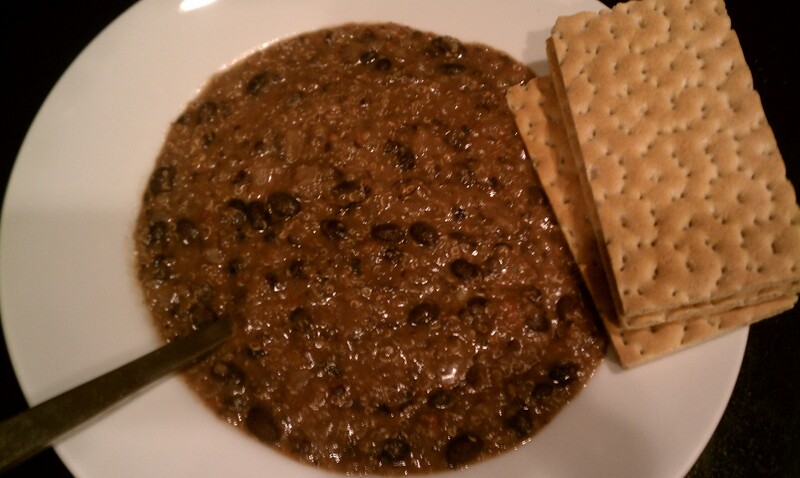 Black bean and Quinoa Soup! Now onto step 4. My mixture was mysteriously watery. Too watery to even attempt to form patties out of it. Instead of patties, I put it in a large glass dish and tried baking to to see if it would harden up a bit. After ten minutes, I was hungry and gave up on the idea of black bean cakes. We instead enjoyed a delicious bowl of black bean and quinoa soup!! It tasted great but not what I had intended for dinner. I don’t know why the directions called for a cup and a half of water to be added to the mixture if it was just going to boil off. The next time I try, I’m going to forgo the water and only add some if needed when I’m pureeing the mixture. Have you made black bean patties before? What was your experience?